Plus, the group showed how this transparency might be used to enhance the frequency stability of lasers. By matching a laser’s frequency to that of the transparent window, the laser can be stabilized in a way that makes it insensitive to wanderlust. Wanderlust is caused by vibrations of the mirrors at both ends of the optical cavity, posing a serious challenge for making laser light as pure of a single color as possible. This new insight into laser stabilization could have a big impact on research and industry endeavors that require reasonably simple laser systems for precision measurement or the development of portable optical-timekeeping devices. This breakthrough almost didn’t happen. Eventually, the researchers decided to try and understand where the mysterious peak had come from and what it meant. The surprising peak that the group originally decided to tune away has now yielded a lovely result. 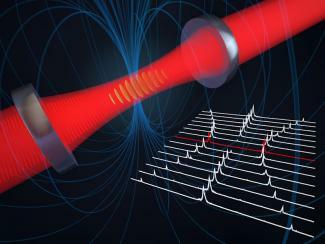 Understanding the peak has led to a promising new way to stabilize lasers to atoms and optical cavities. Optical cavities normally do this as well, but if you change the distance between the mirrors, the transmitted color changes by a lot, kind of like a steer that can wander off anywhere and get lost. In this system, there are two special states of the atom that act like two cowhands that lasso the frequency and hold it in place. As the cavity length changes, the ropes may stretch a little, allowing the frequency to change by a little. But, by using a magnetic field, the researchers showed that the stretchiness of the ropes could be tuned in a way that changed the frequency by up to 20 times less than was normally possible without the atoms hog-tying the frequency down. They also showed that it didn’t matter if the atomic ropes were a little frayed by things such as Doppler broadening—the atoms still do a great job of tying down the frequency. This is a big deal. With the atoms wrangling the frequencies into place, two labs in distant parts of the Universe could build their own versions of the system, and expect them to yield the same frequency––in much the same way as two atomic clocks based on the same kind of atom should always tick at the same rate. A key feature of the new stabilization tool is that it is relatively simple to make in the lab and relatively immune to vibrations. These features suggest these atomic lassos may be useful for industrial and portable devices that work outside of the laboratory.